As we reported last month, Microsoft decided to start migrating its old-school Hotmail users over to its shiny new Outlook service. That migration process might not be going so well, as users have flooded sites like Twitter with reports of downtime to the tune of three hours. Its migration approach was to be a slow one, with the move being optional at first. The Hotmail and Outlook issues are described as an issue with displaying all of your emails, while SkyDrive is having file-editing problems. These are important features for these products, obviously. The status site also shows that a Calendar issue was recently resolved, with the only details provided being that the issue had to do with “maintenance.” Perhaps this was the migration that we were all waiting for. Oops. Not happy right now. #hotmail is down and has been for hours. Anyone know why? We’ve reached out to Microsoft for comment and will update our story upon hearing back. Microsoft is investigating an issue affecting a small number of customers’ access to Hotmail and Outlook.com, and we are working to restore full access to the service as quickly as possible. 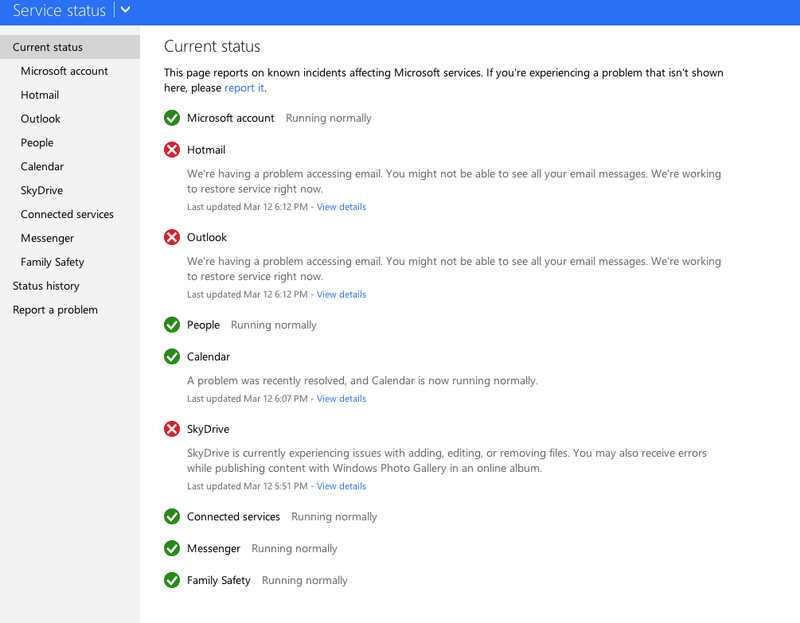 For the latest information, we encourage people to visit the Hotmail and Outlook.com status page (HTTPS://status.live.com/).